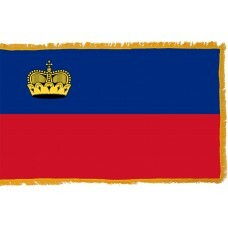 The Liechtenstein Flag features two horizontal bands with the colors blue and red and in the top left-hand corner of the flag is a gold crown. The blue color of the flag represents the sky and the red color represents "the evening fires lit inside houses throughout the country." 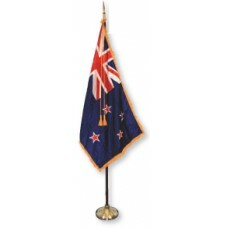 The crown represents the "unity of the people and their prince" and also the country's independence. The Liechtenstein flag was adopted in 1921 and the first flag featured just the two horizontal bands. 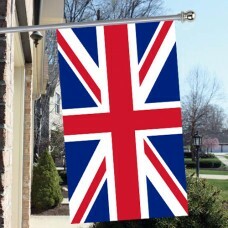 The crown was later added to the flag on June 24th, 1937 when it was discovered during the summer Olympics that the flag was the same as the flag of Haiti. Liechtenstein is located in Central Europe and is a double landlocked country. A double landlocked country is one that is landlocked by a landlocked country. There are only two countries in the world that are double landlocked, the other being Uzbekistan. Liechtenstein is located between Austria and Switzerland and is the 6th smallest country in the world. The capital city is called Vaduz and the largest city is called Schaan. It is such a small country that from 2011, it became possible to rent the whole of Liechtenstein for £46,000 a night. The country was established in 1719 under the Holy Roman Empire. 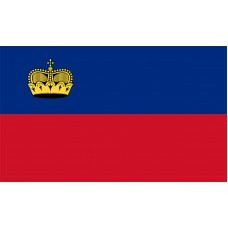 During the Napoleonic war, it was occupied by Russia and France and in 1815 Liechtenstein joined the German confederation until they gained independence in 1866. It is now a country with no army that remains politically neutral. Despite being such a small country, Liechtenstein's economy is thriving, and the country has more registered companies than residents. The economy relies on electronics, textiles, metal, food products, and tourism amongst other things. Liechtenstein is mainly mountainous and is a popular skiing destination for tourists. Even though it is small, it is becoming increasingly popular with tourists with the main attraction being the Vaduz Castle that is located in the capital city. The Vaduz castle is home to the prince of Liechtenstein and every year on the August 15th, Liechtenstein's national holiday, the residents of Vaduz city are invited to the gardens of the castle for drinks as well as a firework display. At first, only the residents of Vaduz were permitted to attend, but now, residents from the other cities also attend. This is the only time where residents are allowed to go to the grounds of the castle as it is not generally open to the public. Another attraction is the Gutenberg Castle which is open to the public. It is located in the town of Balzers and is only one of two castles in Liechtenstein that has survived from when it was built until today (even though it has been restored).